A student stands in a hallway staring at her phone, looking over Instagram. How does social media impact the way you see yourself and others? These two authors explore this topic from two different lenses. Even though students do not randomly break out into song to express their feelings, Glee got one thing right. There is a social pyramid in high school and everybody aspires to be at the top. Social media is a big part of society today. A report by Common Sense Media shows, 75 percent of teenagers in America have profiles on social networks. If someone does not have an account on a platform such as Snapchat, Instagram, Twitter, YouTube, Facebook, ect., they seem to constantly be out of touch with the world. Social media is a new way of communication and getting the word out to mass amounts of people, but is also used to reveal a users individuality. Some might say these social platforms are a form of art. It allows the person to express themselves through photos, captions edits, comments, videos, ect. It seemed like a great idea at first, until the pressures of society’s standards started to take effect. The alter ego that people take on is who they believe will be “accepted.” They think being different or unique might not be acceptable to everyone, which dulls people’s sense of their individuality. Shares, retweets, likes, and comments fuel the feeling of being desired, but at the same time can make one feel as thought their true self is worthless in comparison. A survey by the Royal Society of Public Health found that people ranging from 14-24 years old that are members of social media platforms have been impacted by mental health issues. The survey results found that Snapchat, Facebook, Twitter, and Instagram have all led to increased feelings of loneliness, depression, anxiety, and poor body image. These feelings are only additional to those which cause the concealment of ones unique traits. Some people base their whole self-identity on social media. Hayley Raney, writer for The Register wrote, “Teenagers are clueless to who they are because they depend on social media to discover it.” There are many accounts of cyberbullying, and social media is the venue. PEW research found that “Nearly 39% of teens on social networks have been cyberbullied in some way, compared with 22% of online teens who do not use social networks.” This bullying can discourage people to be themselves. If they take on the image people want, they cannot be tormented for it. Social media pressures cause people to oppress their individuality in hopes of protecting themselves and moving up on the social ladder. Being unique is seen as different and that has a negative connotation. They believe that they are looking out for their own best interests, but they are really taking everything about them that makes them unique, and hiding it away. It has permanent detrimental effects such as diminished social skills and lack of self confidence. People are afraid of rejection, and social media is their blanket. With Instagram being one of the most popular social media platforms today, it is no wonder that many young people feel pressured to compete for likes. In high school especially, teenagers feel the need to fit in. Whether it’s body image, clothes, or social status, they are searching for acceptance. 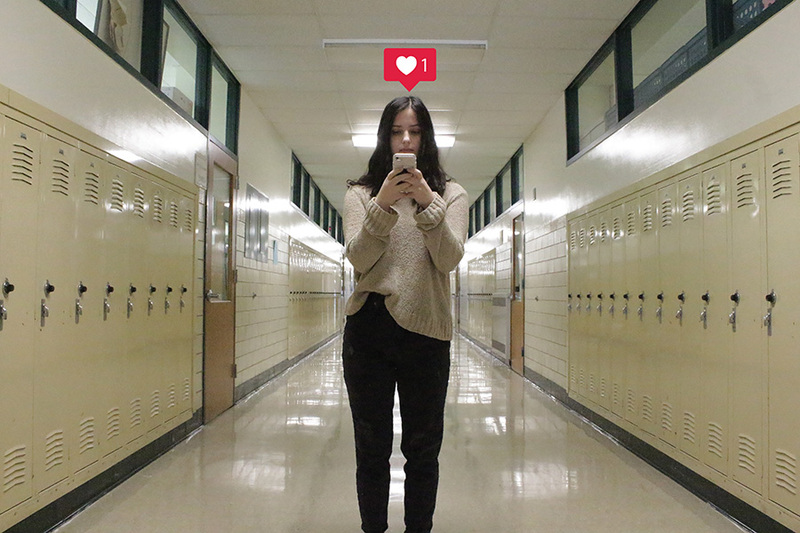 One way students often feel validated is by acquiring Instagram likes. The question now arises: what do Instagram likes really mean for teens? Likes have become so important that many Instagram users resort to acquiring ‘fake’ likes. People will go so far as to buy likes and followers from applications such as “Stormlikes” or “Instaboostgram”. However, if Instagram discovers this happening they have the right to delete the account immediately. That is why there are other ‘sneaky’ ways to gain likes are used more commonly. Using the hashtags “like-for-like” or “follow-for-follow”, implies that when someone either likes or follows you, you will do the same back. Another subtle tactic is to post your Instagram account on other social media platforms. This can be viewed as a way of notifying others of your recent post. In many cases, individuals will not even know their followers or who they are following. “Sometimes people will even follow a bunch of random accounts just in hopes of getting their likes up,” sophomore Thea Gayman said. Popularity through social media is something brought up often in our culture. We see ‘Instastars’, such as Kylie Jenner or Lele Pons, getting millions of views and likes on a daily basis. Young people comparing themselves to stars leaves them feeling inadequate because of unrealistic expectations. “Of course any younger girl is going to be like ‘Oh yeah I want to be like all of these Instagram stars that get so many likes’, but now I don’t care as much… because I know my priorities,” said freshman Olivia Grippin. The competition is not only mentally draining, but time-consuming. Getting the perfect picture can be a strategic game for some. The process of narrowing down your options of pictures to just a few, then editing them to get them how you would like is monotonous. This is just the reason why freshman Chloe Yarnell deleted her Instagram account. However, likes can be beneficial in some instances. From a business standpoint for example, likes can get smaller brands or products recognized. Unfortunately, the majority of young people using the app have no reason to strive for this goal, due to it having no direct benefit to them. What likes boil down to is a false sense of popularity and validation. It is solely a number that can be easily manipulated on a screen. Pushing to get more and more likes on every post is becoming extremely common, and adds unnecessary stress to people’s lives. Instagram distorts how you view both yourself and others causing a lack of identity. It is important to always be the real you because life is not all about likes.